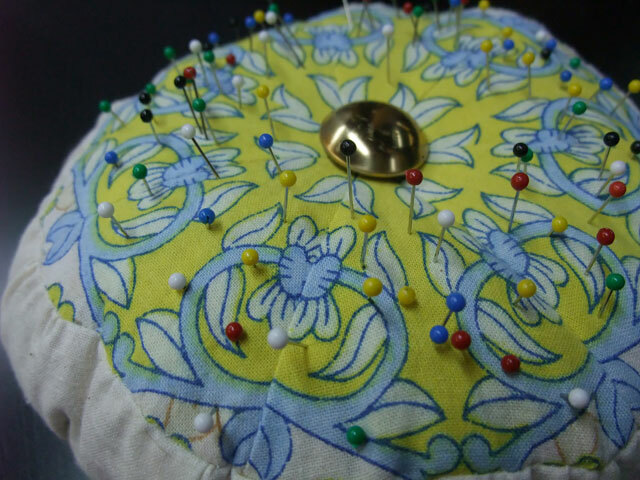 I decided, for no particular reason, to make a pincushion today. I have a new box of pins, so why not? My main concern was how to fill it. I don’t like pincushions filled with polyfill or batting pieces because they’re too light and the pins don’t like going into them well. Tomato pincushions are filled with sawdust, of which I currently have none in the house. Well, except inside my tomato pincushion. I finally settled for Swheat Scoop cat litter, although rice would probably have worked just as well. It’s a fancy pincushion to be sure, and that button on the top hides the fact that those seven points don’t all meet perfectly in the center. Embellishments are a girl’s best friend. This entry was posted in creativity, Quilting, sewing, studio and tagged pincushion, postaday2011, quilt, Quilting, sewing, stashbusting, studio, Studio droppings, tip. Bookmark the permalink. Stuart came by while I was finishing it and asked if I had remembered to use clean litter.